This is a most simple Indian exorcism rite. This procedure is practiced to remove all sorts of negative energies; including ghosts from the being of a possessed person. 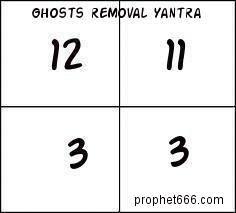 The simple Yantra, which is a geometrical diagram consisting of four unique numbers has to be prepared on a blank white piece of paper. After preparing this Yantra, it has to be rolled and filled with white Mustard Seeds. Then the rolled piece of paper containing the white Mustard Seeds has to be set on fire in front of the possessed person. The possessed person has to be told to smell the burning Mustard Seeds. This simple rite is said to exorcise a possessed person of any negative energy that has entered his being. white & yellow mustard are same or different sir?? ?